As part of the ESFA Schools development programme, Galliford Try have been successful in securing a £6M project to construct new Classrooms/Sports Hall/Changing facilities and Dining Hall at Armthorpe Academy, Doncaster. Armthorpe is the first of three contracts to upgrade schools in the area. 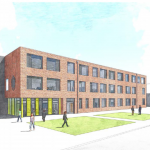 LEEHILL are delighted to have been awarded the Groundworks contract for the above scheme, comprising of: Substructure, Drainage and External Works. We look forward to working with Galliford’s on this contract and continuing to develop our strong working relationship.